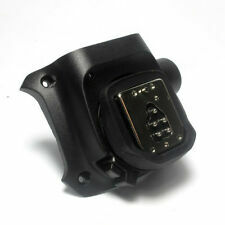 Support Wireless Trigger For Yongnuo YN560IV / YN560III / YN660 / YN968N / YN860Li speedlite. Yongnuo YN560IV / YN560III / YN660 / YN968N / YN860Li speedlite. b, If you use it with other Yongnuo flash, you need a transceiver of Yongnuo RF-602, RF-603, RF-603 III, RF-605. Compatible flash mode: E-TTL, Manual flash. Compatible Shutter sync: front-curtain sync, rear- curtain sync and high-speed sync(HSS/FP), the highest sync speed is 1/8000s. Support FEC, FVL function.Support modeling flash and red-eye reduction flash. LCD screen display, multi-buttons quick operation. LCD screen display, multi-buttons quick operation,The firmware can be upgraded through the USB interface. Support wireless shutter release function. Support simulate (modeling) flash, red-eye reduction flash. HM-Photo Warm Hint Correction filters are typically used to adjust the color temperature of a flash to better match other light sources to improve overall color balance in an image. Choose from a range of reds, yellows, blues, and greens to punch up an image with color and create mood. Support the basic flash trigger (max sync speed is 1/250s) of standard hot shoe. Support simulate (modeling) flash, red-eye reduction flash. Support the flash zooming (auto) and exposure compensation, flash value lock function(FVL). Though its considerably narrower and would be much lighter. the front of the unit resembles a flash body. Its unlikely there will be any AF assist light behind the red lens though. Though these are likely only for the flash wake up feature as the RF-603 II etc have. Yongnuo Flashes Nikon version: YN-568EX, YN-565EX, YN-500EX, YN-468II, YN-467II, YN-465. ---Yongnuo YN-560III, YN-560II, YN-560EX, YN-560, YN-460II, YN-460. B: Other Flashes: (Not support TTL function or HSS). Yongnuo RF-602 C, RF-603 C1 / C3, RF-603 II C1 / C3, YN560-TX C. Canon 1100D 1000D 700D 650D 600D 550D 500D 450D 400D 350D 300D 60D. ---Yongnuo YN-560 III YN-560 II YN-460 II YN-460 in manual mode. ---Yongnuo YN-565EX, YN-568EX II in manual mode. If the hot shoe of your flash is broken, you could buy this item and replace the broken one by yourself, it's very easy to operate. 1 x YN600EX-RT Hot shoe. One year Warranty. 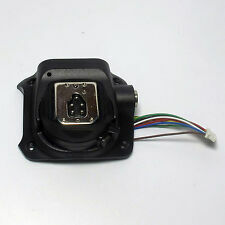 1 x YN600exIIRT Hot shoe(Second verion only). If the hot shoe of your flash is brocken, you could buy this item and replace the brocken one by yourself, it's very easy to operate. We believe getting your item to you is very important. YONGNUO YN-622NTX 2PCS YN622N Wireless TTL HSS 1/8000S Flash Trigger for Nikon (with 2 cables). ---Yongnuo Flashes Nikon version: YN-568EX, YN-565EX, YN-500EX, YN-468II, YN-467II, YN-465. ---Yongnuo YN-560III, YN-560II, YN-560EX, YN-560, YN-460II, YN-460. If the hot shoe of your flash is brocken, you could buy this item and replace the brocken one by yourself, it's very easy to operate. 1 x YN600EX-RT/YN600ex-rtII/YN685C Hot shoe. One year Warranty. Suit for Yongnuo YN560IV speedlite. If the hot shoe of your flash is brocken, you could buy this item and replace the brocken one by yourself, it's very easy to operate. One year Warranty. 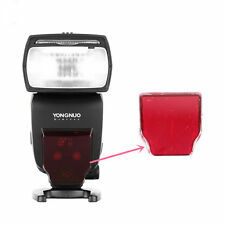 New 100% Original Factory Red Plastic AF Glass Repair Parts For Yongnuo YN685EX YN685EX II Speedlite Flash. It's original parts from Yongnuo factory. 1 X Red Plastic AF Glass For Yongnuo YN685EX/YN685EX II. ( This " Wake up " function is only support the flashgun which havingthe sleep mode ). You can buy extra receivers depends on your flashgun. 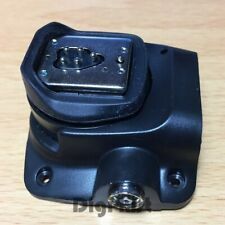 ---There is a 6.35mm plug, you can connect one smaller plug with the receiver, and connect the 6.35mm plug with the studio light, but if your flashgun plug size just can support the 3.5mm plug, we also have a plug adapter, you can conver it into 3.5mm plug. Suit for Yongnuo YN-565EX YN565exII for CANON Version. If the hot shoe of your flash is brocken, you could buy this item and replace the brocken one by yourself, it's very easy to operate. (This is for USA, CANADA, AUSTRALIA, EU, Asian Countries. ). YONGNUO YN-622C-KIT 1PCS YN-622C Wireless TTL HSS 1/8000S Flash Trigger for Nikon. ---Yongnuo Flashes Canon version: YN-568EX, YN-565EX, YN-468II, YN-467II, YN-465. ---Yongnuo YN-560II, YN-560, YN-460II, YN-460. Suit for Yongnuo YN-568EXIII for Nikon Version. If the hot shoe of your flash is brocken, you could buy this item and replace the brocken one by yourself, it's very easy to operate. One year Warranty. Specification: it is an external power source Speedlight. Features: -Protective Case: Protective soft case can be worn on belt or put in a bag; light and easy to carry. 1/4" Thread Screw: Standard thread for tripod mount. This cable connects the PC sync socket of a Yongnuo RF-603 trigger with studio strobes equipped with 6.35mm (1/4") or 3.5mm (1/8") sockets. The PC sync plug fits all sockets with screw lock. It is a good cable for studio photography. The YONGNUO Speedlite Transmitter YN-E3-RT II is a transmitter for wireless flash shooting. Yongnuo YN600EX-RT II, YN968EX-RT. 2, YN-E3-RT/ YN968EX-RT/YN600EX-RT(II)/YN686EX-RT/YNE3-RX. 5, Multi YN-E3-RT II can share slave flashes. YONGNUO YN-622N Wireless TTL HSS 1/8000S Flash Trigger 2 Transceivers for Nikon. Yongnuo First Wireless i-TTL Flash Trigger YN-622N is Released now, it's designed for. You can buy a PC Sync Cable RF-603 6.35mm cable to connect the transceiver with the studio flash, and then youcan use the non-high speed sync flash torealize hihger syand thenyou can use them together in HSS. B: ETTL Flashes support TTL function and HSS: (Uers should set the flash through flash panel). Flash on hot-shoe of transmitter supports ETTL. Compatible with ALL YongNuo/ Canon EXII series flashes. Yongnuo Upgraded YN-622C II Wireless TTL Flash Transeiver / Flash Trigger Supports. 3, It supports 622C communication mode ( YN-622C and YN-622C-TX) and ( RF-605C, RF-603 II and YN560-TX ). Yongnuo YN600EX-RT, YN-568EX II, YN-565EX II C, YN-468 II C, YN-467 II C.
YONGNUO YN600EX-RT/YN565 YN560/II/III/IV. This professional spring PC sync cable can be extended up to 1M. Made out of high grade copper wire and gold plated connectors. Designed for very fast signal transfer rate. Yongnuo: YN-465N, YN-467N, YN-468II, YN-565N, YN-568N. 3 x YN-622 Flash Trigger for Nikon. Support USB firmware upgrade. Support the basic flash trigger (max sync speed is 1/250s) of standard hot shoe (non Nikon body). YN560-TX II , Manual Flash Controller, can trigger YN-560 IV and remote control each group of flash mode (flash output) and the focal length settings by the controller, no need to operate on the flash, the flash display screen will synchronously display the parameters for the corrresponding grouping. Specification: * Advanced model of YN560-TX [Lighter, Smaller, Easier to LOCK on the flashes(but not twist) than YN560-TX] * Can control up to 6 groups meaning that it can control up to 6 flash units. * Support Wireless Trigger For Yongnuo YN560IV / YN560III / YN660 / YN860Li speedlite * Compatible with & Wireless Shutter Receiver of RF-602, RF-603, RF-603 II, RF605. Specification: YN560-TXII, Manual Flash Controller, made specially for Yongnuo YN-560 III made after January of 2013 year, but if you want to use it with our other Yongnuo flash speedlite, you just need the transceiver of Yongnuo RF-602, RF-603, RF-603 II, because YN560-TX has built-in wireless trigger system. You can use it not only as flash controller function, but aslo use it as remote control function. .
Yongnuo YNE3-RX Wireless TTL Flash Receiver for Yongnuo YN600EX-RT YN-E3-RT Canon 600EX-RT ST-E3-RT. Yongnuo YNE3-RX is the world first E-TTL wireless flash receiverfor Canon's new RT flash system. Canon 600EX( RT), 580EXII. 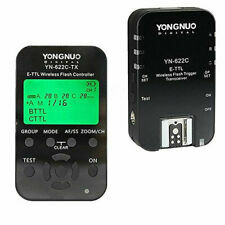 Yongnuo YN-622 Wireless TTL Flash Trigger Single Transceiver For Canon. Yongnuo YN-565EX C, YN-468 II C, YN-467 II C, YN-465 C ( Our yongnuo flash units don't support HSS Function ). With this function, you can trigger remote speedlites in different modes, set up one YN-622C transceiver on hot shoe of flash in TTL. Type: FSK 2.4GHz wireless remote sustem. √ YN560-III flash 2.4G wireless. √ using RF-602/RF-603 2.4G ultra-long-range wireless flash system. √ Adopted by global users trust the allways RF-602/RF-603 wireless flash system. 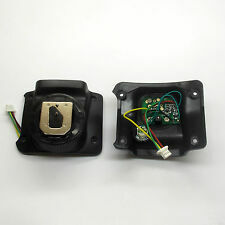 Compatible with YN622N and YN560 Wireless System. below:YN968N,YN622N,YN622N II,YN685N. below: YN968N,YN622N-TX,YN622N,YN622N II(using YN622 mode). YN622N(II) CH1-CH7 Support A/B/C Support Support (Flash output can be adjusted from speedlite) Support. There are also YN622N transceiver one set with two. YONGNUO YN-622N-KIT Wireless TTL HSS 1/8000S Flash Trigger for Nikon. ---Yongnuo Flashes Nikon version: YN-568EX, YN-565EX, YN-500EX, YN-468II, YN-467II, YN-465. Yongnuo: YN-465N, YN-467N, YN-468II, YN-565N, YN-568N. Support the basic flash trigger (max sync speed is 1/250s) of standard hot shoe (non Nikon body). Flash Trigge. Flash Diffusers. Flash Bracket. Flash Heads & Power Supplies. And it makes YN300 Air video light much suitable for filling light from a close distance. YN300 Air adopts ultrahigh CRI LED.RA average value is greater than 95 and close to. YN300 Air adopts LED constant-current driving technology which is specially developed for. The YONGNUO Speedlite Transmitter YN-E3-RT II is a transmitter for wireless flash shooting. Yongnuo YNE3-RT II Wireless Speedlite Transmitter for Canon ST-E3-RT 600EX-RT. YN-E3-RT/ YN968EX-RT/YN600EX-RT(II)/YN686EX-RT/YNE3-RX. Yongnuo First Wireless i-TTL Flash Trigger YN-622N is Released now, it's designed for. 1 x Original Yongnuo Box. Flash Trigger. Flash Trigger Kit. 2 x YN-622N transceivers. You can buy a PC Sync Cable RF-603 6.35mm cable to connect the transceiver with the studio flash, and then youcan use the non-high speed sync flash torealize hihger syand thenyou can use them together in HSS. YONGNUO YN-622N II Wireless TTL HSS 1/8000S. Compatible with YongNuo/ Nikon series flashes. Flash Trigger 2 Transceivers for Nikon. The new upgrade version YN622N II supports receiving the trigger signal. Suit for Yongnuo YN-565EX for Nikon Version. If the hot shoe of your flash is brocken, you could buy this item and replace the brocken one by yourself, it's very easy to operate. If you are satisfied with our service, pls. The YONGNUO Speedlite Transmitter YN-E3-RT II is a transmitter for wireless flash shooting. Yongnuo Updated YN-E3-RT II Speedlite Transmitter for YN600EX-RT YN968EX-RT and Canon 600EX-RT. Yongnuo YN600EX-RT II, YN968EX-RT. Yongnuo RF-603 C3 for Canon 2.4GHz Wireless. Remote Flash Trigger Shutter Release. flash can also be used as a shutter release remote and flash trigger sync. In support of flash waking up and triggering synchronically ,with studio light trigger. Yongnuo YN-560 IV Flash Speedlite Photograph​y Kit Light Stand Bracket B 33" Umbrella. Yongnuo 560IV flash suit for Yongnuo RF-605, RF-603 II, RF-602, YN-622C, YN-622N, YN560-TX. Hot shoe flash mount on top make it easy that you could mount a hot shoe flash slave sensor receiver.The swivel light stand bracket is an ideal accessory for shooting on the run. 2pcs YONGNUO RF605C Flash speedlite Trigger shutter wireless with LCD for Canon 700D 1100D 1000D 5D 7D 5DII. 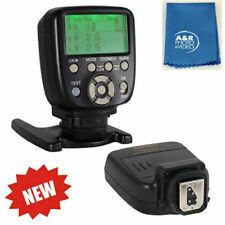 b, RF-603 mode, supports wired / wireless shutter released, all transceivers set to " TRX " mode. Yongnuo YN-565EX C, YN-468 II C, YN-467 II C, YN-465 C ( Our yongnuo flash units don't support HSS Function ). Note: There is a PC Sync port for YN-622C transceiver, you can use RF-602 PC / PC Cable to connect it with flash. For YONGNUO YN565EX YN560 III YN560IV Flash Repair parts. For YONGNUOYN565EX(II) /YN560/YN560II/YN560III/YN560IV flash speedlite only(DO NOT INCLUDE THE FLASH OR OTHER PARTS). (Need reserve). 100% original Original Battery door.